I tried a few different ways of estimating frequency and I thought I'd compare them. If anyone has some other ideas or links to other techniques, I'd like to see how they perform. If you need to track frequency in a noisy realtime environment, I've seen Kalman-based filtering being used. Unfortunately, I don't have an implementation example to provide. 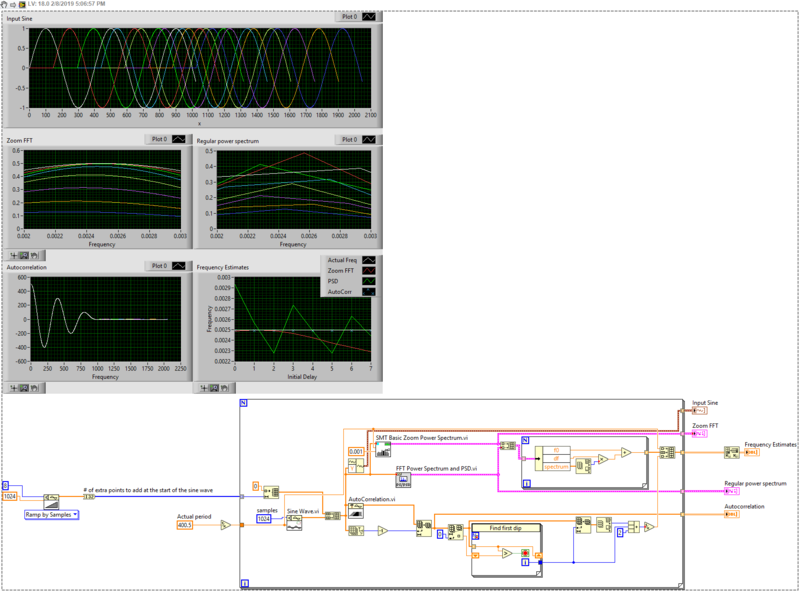 NI has this discrete filter in the Control Design and Simulation toolkit... which does not come cheap. If you need to track frequency in a noisy realtime environment, I've seen Kalman-based filtering﻿﻿ being used. Interesting. I've seen its use in things like GPS. Actually, in my particular application, I'm not tracking a frequency. There's some "dead air" which I simulated above with the zeros and then the signal which is unrelated to the previous signal. Does that rule out Kalman or am I misunderstanding how you'd use it. I have the platform suite so I think I have the control design toolkit. Mhmm..yeah... I know some of these words. 😉 I'll take a look at some of the algorithms they mention. Wavelets are part of the Advanced Signal Processing Library. I know you are looking for the most precise method for this type of waveform, but is there a reason you can't do a peak detect to remove the lead-in?